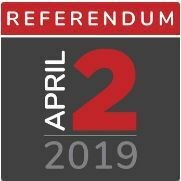 “In order to inform the entire Barrington 220 community about the referendum question on the April 2, 2019 general election ballot, the Board of Education is holding 3 information sessions. All community members are encouraged to attend and ask questions. The agenda at all meetings will be the same. The referendum will not pass (again as others). Who’s going to spend upwards of 200M when the school board president is retiring, and his full time job managing partner of an equity firm that could profit from it??? Voters should take a pass on this referendum and vote again in the fall when the new board president is vetted and more people have time to evaluate our options.